CNN has censored their transcripts...again. 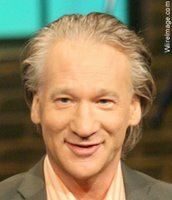 Bill Maher 'outed' RNC Chairmen Ken Melman on Larry King Live last week. And before we start throwing words like 'slander' around, let's remember that this wasn't the first time Melman had been outed. He was outed in an issue of Esquire magazine last year, and has made public statements that dispute his alleged lifestyle and referenced no less than three stories in six months that drew speculation to his sexuality. While not a fan of speculation, I'm even less of a fan of censorship. CNN has a history of changing the record. After allegedly making a reference to his own questionable sexuality, CNN supposedly changed the transcript of an Anderson Cooper interview that he conducted with Jerry Falwell. As we've seen with several republicans in the last few months, my position of where there is smoke, there is fire stands on Melman and others. Larry King: You will Friday night? LK: You will name them? BM: Maybe you don’t go to the same bathhouse I do, Larry. November 11, 2006 -- WASHINGTON - Comedian Bill Maher's malicious snipe on the "Larry King Show" that Republican Party boss Ken Mehlman is gay was pulled from CNN when it aired in later time zones and expunged from transcripts. "Ken Mehlman, OK, there's one I think people have talked about. I don't think he's denied it when people have suggested it," Maher said. Viewers on the East Coast saw Maher's slap, but his comment was edited out when the program aired in later time zones. And CNN's transcript of the interview wipes out the line, saying: "A portion of this transcript has been removed." The blogosphere erupted over Maher's smackdown on Mehlman, drawing kudos from liberals and a rebuke from conservatives. Mehlman, who stepped down as Republican boss yesterday in the wake of his party's landslide defeat on Election Day, could not be reached for comment. A spokeswoman for King's Los Angeles-based program did not return a call from The Post. Video clips of Maher's quip were posted on YouTube. Maher's slap at Mehlman came at the end of a diatribe accusing the GOP of hypocrisy for gay bashing. "A lot of chiefs of staff, the people who really run the underpinnings of the Republican Party, are gay. I don't want to mention names, but I will on Friday night," Maher said. "There's a couple of big people who I think everyone in Washington knows who run the Republican Party," Maher said, before King interjected and asked if he'd name them. "Well, I wouldn't be the first. I'd get sued if I was the first," he said, and then pivoted to Mehlman. Only the two sentences directly targeting Mehlman were edited out and pulled from the transcript. It's not something I expect from CNN, so when they do something like this, it really irks me. I was expecting Bill to address this on "Real Time" on Friday night and he didn't. I wonder why? Perhaps he was censored by producers on his show. I remember him saying that he was going to name names and even Andrew Sullivan seems somewhat supportive of that using Jon Stewart as his voice. So since this guy has been "outed" before, it's okay for Bill Maher to talk about him on LKL? And yes, I get the irony in the former head of the RNC being gay. And no, I don't agree with CNN's censorship. Personally I hate censorship, but I'm thorned between Constitutional Privacy Rights and Slander. When should the line be marked? For shock entertainment? Contrary to Haggart and Foley, this person has not done anything newsworthy about his sexual life. That he is a republican? That he might be gay? He is against gay rights? That could be the spin for the story, that should be the context of an interview WITH that person, not from a comedian, as much as I like Maher, or anyone that is not a first account witness or first-direct source. Certainly CNN missmanaged the situation. They should just had to disclose that they (CNN and Time Warner) don't agree nor support Maher's remarks and that they have nothing to do with them. Because as entertaining at it might have been, even in an important show for CNN as Larry King Live, it was still within the gossip context not news. And unlike this time that it was obvious that CNN censored the interview, it was verified that the controversy between the "we" and "they" was an error from the person who made the transcript. The audio in the video proved he never said We. Christiane said "The audio in the video proved he never said We." I'm glad you pointed this out, when I read the post I was going to mention it if noone else did. Even Gawker has admitted this. Funny how that never got as much attention as the initial controversy did. Hmmm. Censorship to me is more offensive than anything anyone can say. If someone is indeed slanderous, then they need to suffer the consequences of that. But to pretend it was never said at all is wrong. jade --not only this segment was cut from airing for different time zones-- it was cut in est repeat. I kept LKL on after 360 to show my friend who was outed -- and I thought I'm losing my mind when there was no name mentioned. I just could not believe they would cut this. And Maher did promise to name a few people in his own show. I don't have HBO, so I'm surprised to hear he didn't talk about that. I'm not a fan of leaking sexual orientation speculations but I get the point of mentioning top republican politicians who are so anti- and pro "values". Regardless if Maher is right to bring it up I don't understand censoring his words (and LKL's reply with it), when so many people have DVRs, TIVOs, tv tuners in computers and it would be on youtube and blogs the next day. What was CNN thinking? Yeah, I thought I was going nuts too when I watched the repeat and that part was missing. Normally I'm against outing people, but Mehlman is/was the head of a party that actively works against gays. It's hypocrisy at its finest and I think it's time middle America finds out that it's all just a manipulative game to them. Larry King isn't a news show, so I was okay with it. I am never okay with censorship. As for Anderson's "pronoun problem", as others have pointed out, he actually didn't say that. It's just really an unfortunate coincidence that the transcript people made that mistake to someone who doesn't talk about their orientation.